This recipe for pull-apart Amish Friendship Bread sticky buns are a great way to use up your starter AND make the whole family happy! In a large bowl, mix starter and milk. Add in yeast and ¼ cup sugar. Mix well and let rest 5 minutes. Add in melted butter, egg and salt. Mix well. Add in 1½ cups of flour and mix well. Keep mixing in flour until a soft dough is formed. Turn onto a lightly floured surface and knead dough until smooth and elastic. This takes about 7 minutes. Grease a clean bowl and add in kneaded dough. Cover with towel and let rise 1 hour. Roll out onto a floured surface into a 8" x 13" inch rectangle. Spread softened butter on top and sprinkle on ½ cup of sugar and cinnamon. Begin at narrow side and roll up dough. Seal the seam. Cut nine 10¾-inch thick slices. In a greased 9" x 9" pan, spread out ½ cup packed brown sugar. Pour half of the milk over the sugar in pan. Place each cinnamon roll in the pan. Sprinkle remaining brown sugar over the rolls and pour remaining milk over the top. Preheat over to 375° F (190° C). Let rise for 30 minutes in a warm place. Cool for 5 minutes in pan and then invert onto a serving platter. mistake in recipe, what do you do with the yeast? No mistake in the recipe. Step 3 tells you to add the yeast and 1/4 cup of sugar to the mixture. I would like to make these for a church luncheon, but I have an egg yolk allergy and cannot touch it. I make my own pastries, etc., for myself and my friends have no problems with it being “yolk-less”. However, people at these events like “the real thing”. How do you think wearing a pair of “latex” (or whatever they are made of now) gloves would work? Do you have any idea on what to do about the rolling pin? Any suggestions? I appreciate your help. Ahh, every year for Christmas breakfast I make sticky buns from the recipe in my mom’s old Better Homes and Gardens Cookbook from the ’50’s. I’ll have to try this recipe! 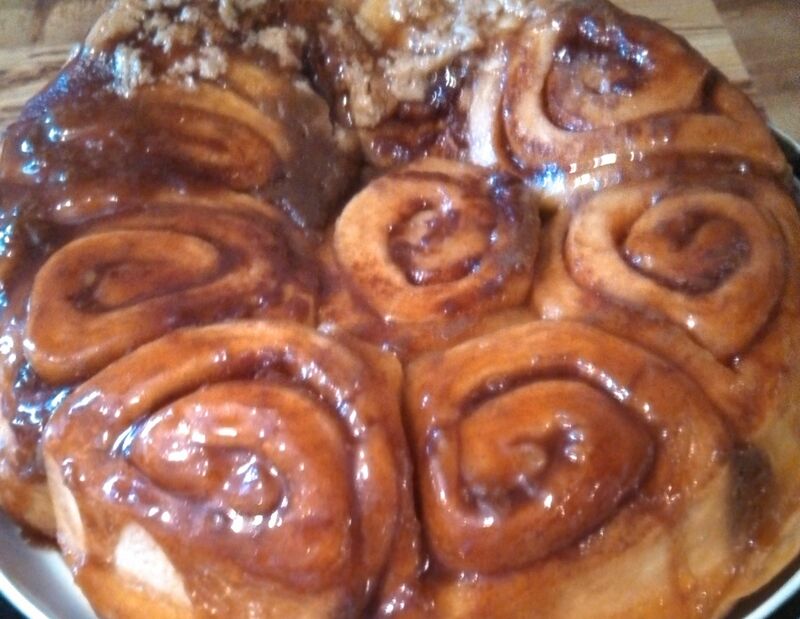 This sticky bun recipe will be perfect for my grandsons!! The love when I have ‘caramel rolls’ for them. I know these will be much better! In fact I am making them for me too!!! I would love to make these for my husband and kids. now the sticky bun lady. LOL, so glad they worked out for you, Lisa! What does “warm” in the microwave mean? How long? I don’t own a mirowave. Can I warm milk on stove top dissolve sugar heat to 100°-110° add pour into bowl add yeast let set 10 mins. THEN add into AFB starter?